Leaders from Evans High School and University of Central Florida came together for a day of service, networking and award recognition. Forty juniors and seniors from Evans participated in the inaugural Leadership for Educational Attainment Developed through Service Youth Summit May 2 at UCF. LEADS is a collaborative leadership program between the Center for Community Partnerships and Evans High School, A Community Partnership School in Pine Hills. The program allows middle and high school students to develop leadership skills through service-learning projects to help address social issues in the community that are important to the students. 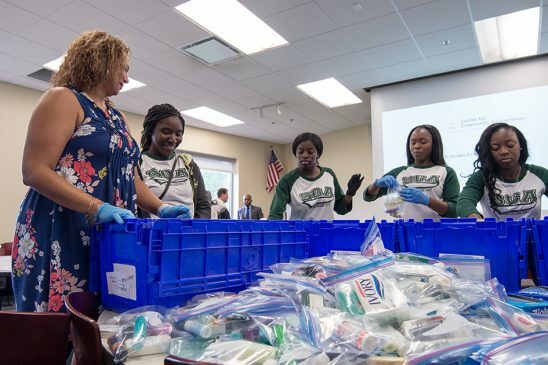 “These programs are essential … because we want these students to know there are opportunities to continue to do things they are engaged in now when they move to a campus community,” said Jarrad Plante, Ed.D., CNP, program coordinator for the Center for Community Partnerships in the College of Health and Public Affairs at UCF.